The Beylerbeyi Palace (Turkish: Beylerbeyi Sarayı) is a palace located in Beylerbeyi neighbourhood of Istanbul, Turkey at the Asian side of the Bosphorus, situated just north of the Bosphorus Bridge today. Designed in the baroque style by Sarkis Balyan, Beylerbeyi Palace seems fairly restrained compared to the excesses of the earlier Dolmabahçe or Küçüksu palaces. It was commissioned by Sultan Abdülaziz (1830-1876) and built between 1861 and 1865 as a summer residence and a place to entertain visiting heads of state. Empress Eugénie of France visited Beylerbeyi on her way to the opening of the Suez Canal in 1869 and had her face slapped by the sultan's mother for daring to enter the palace on the arm of Abdül Aziz. Other regal visitors to the palace included the Duke and Duchess of Windsor. The palace was the last place of captivity of the deposed sultan Abdulhamid II from 1912 until his death there in 1918. 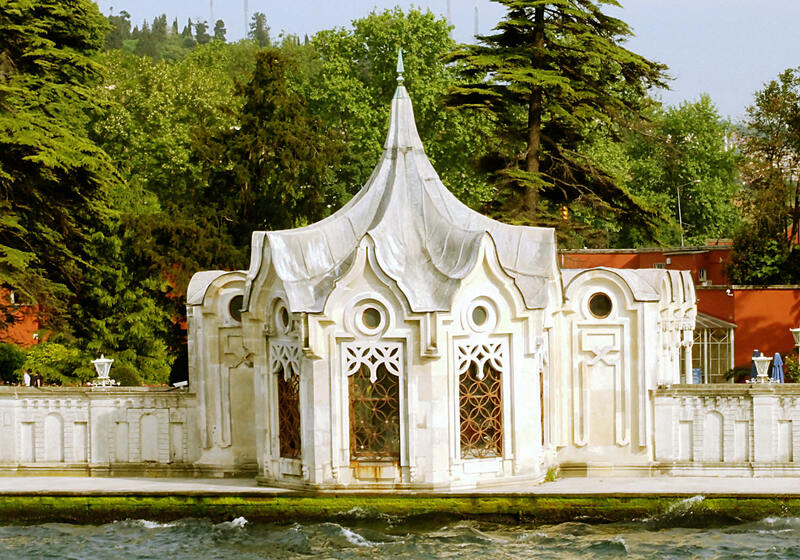 The palace looks its most attractive from the Bosphorus, from where its two bathing pavilions, one for the harem (women's only) and the other for the selamlık (men's only), can best be seen. One of the most attractive rooms is the reception hall, which has a pool and fountain. Running water was popular in Ottoman houses for its pleasant sound and cooling effect in the heat.